recipes have all been well worth the effort, but it’s not something I can do on a weeknight. Taste This is definitely in the former camp, full of delicious recipes you can whip off easily with screaming kids pulling at your leg. In fact, some of the recipes in Taste This!, like the apricot chicken and the roasted asparagus, are very similar to some of our regular weeknight dishes. Many of the recipes have handy shortcuts like using pre-cooked chickens to prepare the chicken tacos, chicken curry, and the chicken tinga. The photographs are incredibly gorgeous, making me realize how much work I have to do to get my Tasty Tuesday shots up to par! 1) Preheat oven to 350 degrees farenheit. 2) In bowl, mix together corn flake crumbs, garlic salt, Italian Seasoning, salt and pepper (CHEFDRUCK version: add parmesan here too). 3) Wash chicken and pat dry with paper towel, set aside on plate. 4) Pour salad dressing into another bowl. 5) Take chicken and dip both sides in salad dressing; then press into corn flake mixture. Coat both sides. 6) Place chicken in 9×13 baking pan and drizzle salad dressing on top. Bake 45-55 minutes, until golden brown and juices run clear when poked with a fork. (this took a little longer than an hour for me). 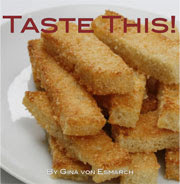 Jersey Bites is giving away two copies of Taste This! Enter by 3/11 to win. ← >Could Baby TV Not Be As Bad As We Thought? >Vanessa….this looks wonderful. 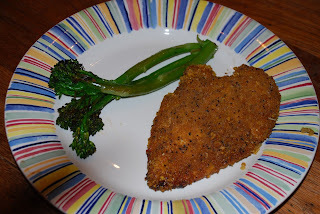 Next time I take out chicken breasts I will try it. >Sounds delicious AND easy – I’m pretty sure I’ll be trying this one! Thanks.